It is not just an individual's efforts at Bike Commuting that make a difference -- organizations can step up and pave the way for less cars on the street, and more people-powered conveyance. Bikes Make Life Better Co-Founder Amy Harcourt says, in a Fast Company article, "...we plan, design, and implement and support any kind of program related to bikes in an organizational setting." If a company is in need of bikes, Harcourt's company consults on the best model, options and branding. Yes, branding. Bikes can be about the organization's public image, after all. Google is even into "version 2.0" of their bicycles, with a re-design. The company got about three dozen designs, every thing from a BMX-style bike to a modern take on the old Penny-farthing high-wheel bike from the 19th century. It chose a far more conservative model -- something of a beach cruiser with coaster brakes and hand brakes. 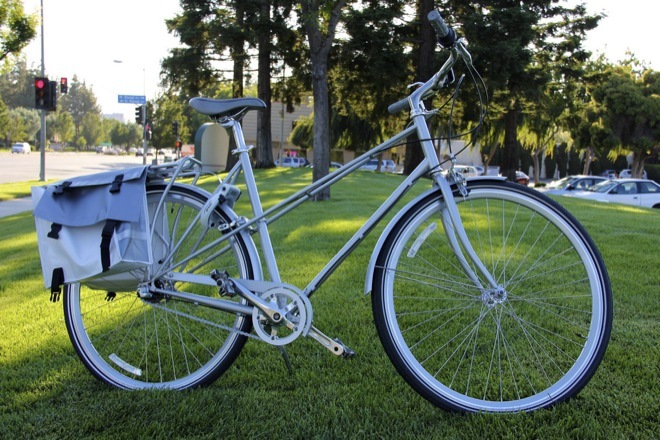 The steel bike comes with a basket and bell. And it features fenders to keep spray off cyclists' backs in the rain, and a case covering the chain to protect their clothes from grease. Single chip for digital broadcast in Europe? In Europe, there is a move to use a single transceiver chip for digital radio broadcast. This would ensure interoperability of all new digital radio receivers in European countries where broadcasters are using DAB, DAB+ or DMB, and/or analogue AM and FM. So, are you as confused about which i-thingy to get as I am? I mean, what's the difference between the iPad mini and the iPod touch? Besides the size of the display... which is a Retina display on the iPod, but not on the Mini. Oh, and the camera. Or was that the processor? Maybe this leaked video will help clarify what device to buy -- until the next device comes out. SkyNet is in development, so why not a Terminator? The Defense Advanced Research Projects Agency's (DARPA) Robotics Challenge, launched Wednesday, will bring together some of the nation's top robotics engineers in a bid to develop some of the most advanced robotics yet built. Among the humanoid robots, some have hands, or claws, and most with the ability to use tools. A few have eyes; all have four limbs. Teams come from Carnegie Mellon University, NASA's Jet Propulsion Laboratory, Raytheon, Lockheed Martin, the Massachusetts Institute of Technology, and the University of Washington. With Wikipedia nearing completion (the rote memory behind our version of SkyNet is the "little data" found on the inter-web), it won't be long before H-Ks and T-300s are on the prowl. Bicyclists Protest U-Turns in D.C.
Washington DC (and Dublin) is one of the best cities for bicycling. More bike lanes, decent enough weather year-round. Terrain that is mostly reasonable. But the drives... much like Ireland's capital) leave something to be desired. In this DCist post, we learn that organizers are looking to protest, specifically the abuse of designated bike lanes on Pennsylvania Avenue -- America's main street. So stay legal, DC drivers, and don't run over unsuspecting cyclist! As I reported in Government CIO Magazine, the cloud is an integral part of the government's streamlining efforts. But can agencies expect to save millions, as the IW article posits? GSA's inspector general recently released an audit of the General Service Administration (GSA) move from Lotus Notes to Google Apps for 17,000 employee. Unisys is the lead on that aspect of the project; GSA awarded a multi-year contract to Salesforce.com to support Notes migration. The audit found some of GSA's projected cost savings couldn't be verified, and performance measures were unclear or otherwise lacking. And GSA hadn't done an inventory of the applications being moved to the cloud. As a result, the inspector general was "unable to verify whether adequate progress is being made toward the projected savings goals." That's disheartening. Clearly, when considering a migration to the cloud, agencies should include in their roadmap a set of metrics. After all, to show progress, one must measure against valid criteria. Star Trek Replicator? Not yet, but 3D printing is hot! Until recently, 3-D printing was limited to only those who could afford the industrial machines. The typical 3-D printer works layering melted plastic with a nozzle, controlled by data from a computer program, creating three-dimensional objects. Some printers can build objects made of other materials, including glass and metal. The less-expensive personal devices and open-source nature of many designs (files you download off the inter-webs) to allow users to customize their own things -- think personalized iPhone cases and jewelry or those shoe gewgaws kids like. Sites like this are popping up to help the hobbyist or budding engineer design and print prototypes or even finished products. You can create and share 3d models at sites like this. A variants on the plastics "toner" is selective laser sintering (SLS). This builds objects by laying down a fine layer of powder and then using the laser to selectively fuse some of its granules together -- and output objects using a wide range of powdered materials, such as wax, polystyrene, nylon, glass, ceramics, stainless steel, titanium, aluminium and various alloys. During printing, non-bonded powder granules support the object as it is constructed. Once printing is complete, almost all excess power is able to be recycled. 3D printers capable of outputting in color and multiple materials will continue to improve to a point where functional products will be able to be output, one at a time at home, downloaded from the net. Not quite downloaded coffee, but pretty darned cool! Two Brothers Take Old-School "Ahead of the Curve"
Who is Spying on You? Worse, Who is Spying on Your Organization? In the internet age, industrial spying is alive and well. The means to grab a company's proprietary information is no longer a janitor going through the bins after hours. Now, automated tools enable infiltration and compromise. While governments may be actively engaged in cyber snooping, few CIOs and other decision makers realize the extent to which criminals and other maleficents will go to get secrets, and not just ones about national security. Recently a worm, ACAD/Medre.A, showed a big spike in Peru on ESET’s Live Grid (a cloud-based malware collection system utilizing data from users worldwide). ESET’s research shows that the worm steals AutoCAD drawings and sends them to email accounts located in China. ESET has worked with Chinese ISP Tencent, Chinese National Computer Virus Emergency Response Center and Autodesk, the creator of AutoCAD, to stop the transmission of these files. ESET confirms that tens of thousands of AutoCAD drawings, primarily from users in Peru, were leaking at the time of the discovery. In another case, McAfee, security firm now part of Intel, released a report that presents the details a single criminal's successful attack, lasting several years, against at least 72 organizations. The compromised companies took far too long -- sometimes years -- to fix the problem, and it is unclear if any knew the extent of the breach when they sanitized corrupted computers. The Economist says, "The goal seems to have been retrieving massive quantities of proprietary and confidential information, whether for purposes of duplicating intellectual property or, in the case of the World Anti-Doping Agency, finding out which athletes might be tested next, or even modifying test results." Interception of communications is another vulnerability many fail to address. The recent row over Blackberry encryption capabilities in the context of Internet and communications technologies and free speech are not new -- but this front in the war between those who know secrets, and those who want to know, expands to cover services such as Google Talk and the telephone and video services provided by Skype and other SIP-based Voice-over-internet (VOIP) providers. What Can You Learn from Pirates? When it comes to ensuring uptime, reliability and service, we can learn alot from pirates. Not the Somalia kind, but the clever founders of The Pirate Bay. The site, notorious as the premier search engine for torrents on the internet, nevertheless serves a large and discerning clientele. Reasons cited for the move to the cloud centered on making the site less vulnerable to outside threats (and DDoS is not the only threat to your infrastructure), but also hosting in the cloud also makes the site easier to scale, reduces downtime, and is less costly. The Pirate Bay is hosted at cloud hosting companies in multiple countries where they run several Virtual Machine instances. The setup also makes the BitTorrent site portable -- it can move elsewhere without too much work. “Moving to the cloud lets TPB move from country to country, crossing borders seamlessly without downtime. All the servers don’t even have to be hosted with the same provider, or even on the same continent,” The Pirate Bay told these reporters. "If one cloud-provider cuts us off, goes offline or goes bankrupt, we can just buy new virtual servers from the next provider. Then we only have to upload the VM-images and reconfigure the load-balancer to get the site up and running again.” While this model de-centralized most of their infrastructure, not everything was moved to the cloud: load balancers and transit-routers are still maintained by The Pirate Bay, enabling the site to hide the location of the cloud provider and secure the privacy of users. All-in-all, a very reasonable strategy for a high-volume site. Lanthanum? Unubtanium? What's the Most Valuable Resource. THE world’s most valuable resource is talent. No country grows enough of it. Some, however, enjoy the colossal advantage of being able to import it. Rich, peaceful countries can attract clever immigrants. Unlike other useful imports, they cost the recipient country nothing. They come, they study, they work, they set up businesses, they create jobs: 40% of the founders of Fortune 500 companies are immigrants and their children. Yet they are only 23% of Americans. I've consistently advocated for immigration, both in the U.S. and in the Republic of Ireland, as the secret sauce to boost entrepreneurialism. My grandfather arrived illegally in New York, and made his way to being a successful baker, in spite being an "enemy of the state" during the 2nd World War. He, like many others, chose to be American (nobody chooses their heritage/nationality) -- the hallmark of civilized human rights is the freedom to migrate. And these two countries remain magnets for the talented, the motivated, the (learned or not) quick-witted. Has the Newton Come Full-Circle? Are you eagerly awaiting the iPad Mini? An alternative to those so-called dedicated e-readers, with full Apple functionality. Is the Newton re-born? The Newton was Apple's personal digital assistant (PDA) developed as the precursor to tablets of today. You may remember Palm and others (I had a fascination with the Newton, as well as Sony's own PDA, non-Export ones which I hunted for during many a trip to Japan). Development of the Newton platform started in 1987 and was officially ended by Steve Jobs Jon his return to the mothership in 1998. (I have a Newton-SJ story, see post script below). During its heyday, the Newton was the benchmark for tablet-like devices. But it was ahead of its time. Famously lampooned, the device didn't live up to its hype. But true believers have been rewarded with the iPhone and iPad, legacy of the lofty goals of the device Steve Jobs loathed. When I and my compatriots launched Bluedog as an Application Service Provider (we were partnered with S.A.P. to deliver their offerings in the hosted model, a precursor to the software-as-a-service model we utilize now), we needed a key piece of technology from Apple, a specialized adapter for SAP that worked with WebObjects. We had a meeting with Steve Jobs and Fred Anderson (arranged by our investor in Dublin), to ask to use the proprietary technology. On the elevator ride up to the conference room at One Infinite Loop, Steve's assistant noticed my Newton MessagePad 2100 (equipped with a Metricom 128kb (!) wireless modem). "Get rid of that thing," she demanded, "Steve loathes them!" Needless to say, because, back then, the cloud and the ASP model did not "move hardware," we were unsuccessful in our quest for the elusive WO adapter from Apple. In the end, we built our own solution. Other Steve Jobs stories and tales from the long road of a tech entrepreneur in my forthcoming book. Need Cloud Expertise? Who Ya Gonna Call? While Amazon and Google have pressed ahead with cloud offerings, the ability of large organizations such as government agencies, Fortune 500s or non-government organizations to leverage this vast set of resources is constrained by finding trustworthy experts to help guide and shape the future. Architects and engineers who fill these new hybrid jobs -- as well as the set of skills needed to execute them -- are still morphing, both substantially and semantically. Some, like cloud architect, cloud software engineer or cloud developer, cloud systems administrator, do obviously pertain to this lofty new environment. But the skills transfer for most technicians and others remains murky. At the early stages of adoption, organizations should seek out thought leaders who understand service oriented architecture (SOA), the role of mobile computing, and who can bridge the gap between techno-jargon and clear language, so CIOs, CFOs and business strategists can find the right path. It should be obvious to anyone surfing the net that all those web pages we enjoy at zero cost are being ad supported (or otherwise subsidized by goodwill or some other contribution). In many cases, the data from users/readers is what is valued -- companies are able to take user data, sell it to advertisers, and make money. That data you're giving away online is worth something, but have you ever wondered how much? A privacy add-on for Firefox gives captures some metrics to help. This post brought to you by Ademero. All opinions are 100% mine. In my experience (as readers of Intellectual Capitalist may recall), three major challenges confront the enterprise with regard to document management: the ability to collect, then migrate, and finally deliver large-scale document management to end users. In my opinion, a solution from Ademero addresses this quite handily. In reviewing their offering, I have found tha Content Central does a great job of tackling this tripartite calling, resulting in a kind of "one-stop shop" for document management. Ademero's Content Central sets the bar for document management and workflow solutions, where users access and interact with the application with whatever preferred web browser is handy. All document interaction (from upload, meta data classification, etc.) occurs within this browser-based interface. I like that users can interact with Ademero's offering for capturing, indexing, and retrieving documents in a familiar environment. The workflow aspect -- from approving and distributing documents -- maintains this consistency. Traditional methods of storing and managing documents are the ubiquitous filing cabinet for paper documents and servers for file shares. Let's not forget e-mail systems for electronic documents. But these methods are a source of headache due to the inefficient use of physical and virtual space, the inability to quickly search documents, or locate ones based upon some ad hoc selection criteria (such as author name, client, or other contents)/ This has proven, in the 21st century, to be a flawed and inefficient process to capture, store and retrieve the documents. I've long worked with designing and implementing document management systems can eliminate these problems and provide the capability to transform work flow into automated processes. Scanning paper documents into electronic formats, convert the archaic retrieval of documents into a simple but robust search mechanism and leverage existing data management process, systems and tools housed within large organizations' information technology infrastructure is one of my areas of expertise. I have long been a proponent of the advantage of a browser-based application, including quick deployment, access and audible access, and remote connectivity. With Ademero, administrators install Content Central on a single Microsoft Windows server or across multiple servers for performance. After user accounts have been defined, users connect from available Windows, Mac, or Linux computers on the network. Inside Content Central users can create documents using PDF-based electronic forms. Documents and other files can be captured from document scanners, network folders, e-mail accounts, or user interaction. It is a huge advantage for Content Central in that it converts scanned images into fully searchable PDF files, and all documents can be retrieved using content keywords and other index information based. Because this is based on the type of document, users are assured of flexibility in their search, a key need Ademero satisfies. I found that the app uses integrated e-mail and fax tools -- this enables teams to distribute documents without requiring external helper software. A powerful workflow engine can manage information behind the scenes based on system events or schedules. I think it's worthwhile to condiser Ademero for those readers interested in content or document management suitable for the enterprise, so check out Ademero. As every feature included in the price-to-play, there aren't any confusing add-on modules to tackle. A fine way to deliver document management software, without a doubt. So how's the internet working out for you, these days? 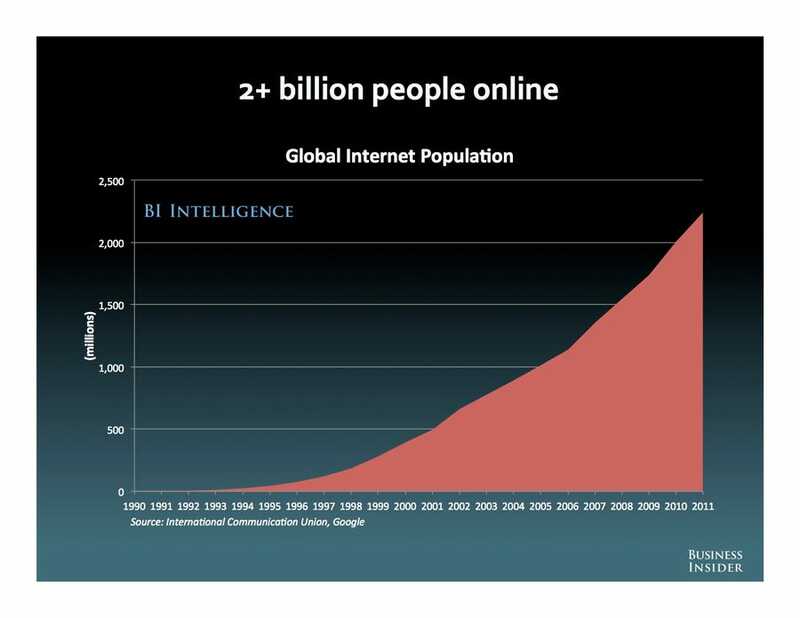 Alex Cocotas and Henry Blodget at BI Intelligence have put together a nice summary of the "state of the internet," for this year. Their organization is a research and analysis service focused on mobile computing and the internet. While wearing helmets when bicycling is accepted as a given, some experience suggests that if a city wants bike-sharing to be more popular, going without helmets may be necessary. A two-year-old bike-sharing program in Melbourne, Australia — where helmet use in mandatory — has only about 150 rides a day, despite the fact that Melbourne is flat, with broad roads and a temperate climate. It would seem bike share programs in Montreal, Washingon and Minneapolis show that, while helmet use among people using these programs is lower than cyclists in those cities using their own bikes, the accident rates are also low. A new fact sheet by the European Cyclists' Federation (in PDF) Safety In Numbers claims that higher rates of bicycle use result in lower numbers of casualties. The reason is that cycling is safer for each cyclist when more people do it. So perhaps the trade-off in health benefits from helmet-less riding to in aggregate increases in ridership are worth it? If you think downloading movies is a problem, what about Starbucks coffees? Well, the digital revolution continues unabated. Many ripple effects have been felt -- and the movie / music industries will tell you, ease of copying digital content has wreaked havoc on them (or not). What if physical objects could be replicated, and, if an original object, without the permission of the designer? That's not such a "what if" -- the advent of three-dimenstional printing is upon us. The basics of 3d printing – and digital fabrication in general – is that the printer takes a digital model and turns it into a real, physical object. The designs are represented as files which describe the surface geometry of a 3D object. Sort of an AutoCAD-on-sterioids approach to describing something. There are a couple of ways of getting a file to print with: use an existing file; design a model yourself in CAD software; or scan a real-life object. But what if you replicate something someone else has rights to? Over at The Economist,this article captures the essence of the conundrum. While you peruse it, download a cup of Starbucks coffee, and enjoy. Or at least the mug to hold your double-tall, extra foam latte. This is a Sponsored post written by me on behalf of Bitdefender for SocialSpark. All opinions are 100% mine. I had a recent scare on my home computer, but it was handily intercepted by BitDefender, part of a line of 2013 security solutions. Since I run a multi-computer environment, including behind a secured LAN and ones that are connected to the Internet. I was glad for Bitdefender Total Security, which keeps my local network secure and blocks threats to sensitive information, since, as we have all experienced, outside threats can worm their way into a home network when least expected. I was glad the user-friendly proactive protection was there to counter virus, spyware and phishing attacks. As a parent, I will certainly be putting parental controls to use, and probably social network protection. I liked the BitDefender Safepay, with the need to work through my kids' holiday wish list to get ahead of the Xmas curve. Since the Autopilot feature keeps the software working unobtrusively, I don't even notice. And when one of my Facebook friends sends me a bogus link, BitDefender is there. I check out PCMag and CNET, and discovered BitDefender is ranked #1 in antivirus software, earning both sources' Editor's Choice awards. That confirms my recent experience with BitDefender; I am going to check out the opportunity to win a new computer (always worthwhile) since mine has BitDefender installed. I am going to check out BitDefender's increased focus on useful services, such as Safebox, Device Anti-Theft, and Parent Control. I looked over the improved dashboard, and this kind of computer protection integrates well with my mobile devices. My efforts at bringing Kaizen to knowledge workers is not my only interest. In the new millennium, remote work (telework) is the future. Obviously some workers will have to man the walls, turn the sprockets, oil the gears. But for the vast majority of creatives, programmers, and other thought workers, enabling remote work, according to many sources, will increase the overall productivity by 22%. And small business owners can adopt mobile and cloud technology with little expense. Indeed, the benefits are manifold with the trends showing that going mobile is the way to access the internet. With upwards of 3o% of the global workforce already telecommuting, the cloud and mobile computing will boost those numbers.